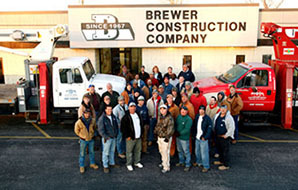 Brewer Construction Company of Eastern Oklahoma, Inc. was founded over 40 years ago on honesty and integrity. We are a family owned and operated business, conveniently located in Chouteau, Oklahoma which allows us to serve all of Northeast Oklahoma. When you decide to contract with us, you can be sure you will get complete satisfaction. Over the past 40 years we have grown into a construction company that can handle all aspects of your construction needs. We are staffed with professionals that know and understand the different faucets of your construction needs. We are dedicated to complete customer service and delivering a product you will be satisfied with for years to come. We look forward to serving you. Our industry experience includes: Design/Build, General Contracting, Project Management, Consulting, Construction Estimating and a skilled office staff to accurately track projects from start to finish. We specialize in pre-engineered steel buildings, but we have experience in all types of construction. Our financial background and bonding capacity allow us to construct large diversified projects such as an industrial complex or a gymnasium. At the same time we are not so large that we won't welcome the opportunity to build your small workshop. With this wide range of experience we are able to serve our industry with competence and professionalism. Since our inception, we have provided construction services for hundreds of projects throughout Northeast Oklahoma including schools, churches, industrial buildings, retail centers, auto dealerships, office buildings, public buildings, restaurants and many others.